The Thundering Saints donated $10,000 to Hospice of the Red River Valley, generated from proceeds of the Sixth Annual Debbie Gabel Memorial Ride held in Valley City on July 26. 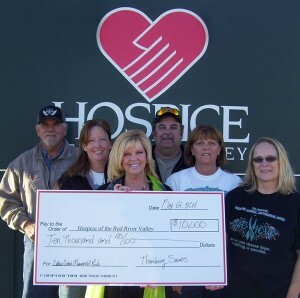 The donation will be used to provide compassionate end-of-life care to those in Valley City and surrounding communities. This year’s ride attracted approximately 150 registered motorcycles. Following the ride, participants enjoyed a dinner at Boomer’s, a live and silent auction, street dance, featuring “8th Hour,” and a raffle. Raffle prizes included a $500 cash prize, a Broilmaster grill, Thomsen 30 O6 rifle, Napoleon patio flame, $300 meat bundle and Alpen binoculars. Next year’s event is schedule for July 25, 2015.